For more and more writers, an online grammar checker is becoming a must-have editing tool. Any tool that highlights common grammar and spelling mistakes and offers quick and easy corrections is going to help improve your writing. There are a lot of free grammar checking writing tools available online now, and most of them can offer you basic help. But to get really useful, in-depth analysis of your grammar and writing style, you will need to consider using a premium version editing tool. When you are choosing an online grammar and writing assistant, the most important factors in your decision will be how well a tool suits your specific needs. The choices will be different for every writer depending on what platforms, software and applications you are using. For some, a fully functional desktop editor might be the only top priority. While for others, mobility and portability might be necessities that require working with multiple browsers and using smartphone integration. Of course, the price is a big consideration for many writers. Before I even start on my review, this one is a winner already. It is around one-third of the price of comparable premium writing and grammar checkers. To help you in your decision-making process, here is my hands-on review. 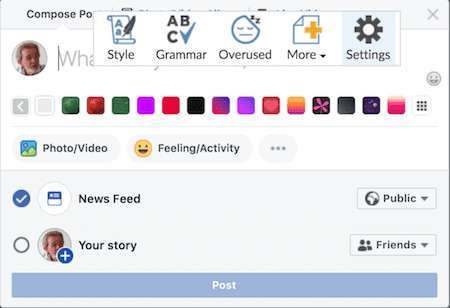 What about outside the web editor? So how good is it overall? From the outset, I have to say that it only takes a few minutes to discover that ProWritingAid really has a lot going for it. Compared to similar applications, just the toolbar of the editor alone lets you know immediately that there is a lot on offer to analyse your writing. I am using the premium edition for my ProWritingAid review, but even if you try the free version or free trial you will be able to discover how helpful it is. Once you open the desktop web editor, the graphical menu at the top of the screen gives you access to so many ways to analyse, check and improve your writing. I spent my first half an hour clicking all the buttons and discovering that the text from my work-in-progress novel really needed a lot more work. While it certainly checks your grammar, the web editor gives you access to more than twenty checks, reports and tools. That’s a lot of grunt under the hood for a grammar and spell checker application. The real-time check is a very handy tool to give you an overall running account of your writing as you make your corrections. It sits in the top left-hand corner and works like a running scoreboard telling you how many possible errors or issues you have left to work on. You can see that there is a lot of work left for me to do with my text! Once you get into analyzing your writing, it uses different coloured underlines beneath words and phrases to guide you to suggested corrections. One click and you have the correction or suggestion. Here are a few examples of the way the editor works when highlighting quotation marks, redundancy and passive voice. It was a surprise to discover that it finds unmatched quotation marks. I have not seen this function in any other applications before, and it is so useful. There are similar pop-ups for many other suggested corrections. However, the editor has more in store when you use some of the reporting tools available in the toolbar. Here are a few examples of reports for repeated words, clichés and an overall reading report. These reports are very detailed and are interactive with your text, which makes using the information to make corrections very easy. Other tools and reports include stickiness, sentence length and overused words. It’s a long list! There is no doubt that the web editor is feature-rich, user-friendly and above all else, extremely helpful in improving your writing. ProWritingAid has apps and plugins for a range of software applications. There is a Chrome extension, Microsoft Word plugin, Google Docs extension, but importantly for many writers, it integrates with Scrivener. As with similar premium apps, there is no Word integration for Mac users. This is a Microsoft and Apple problem, so no blame on the program developers here. But as an Apple user, it’s a bummer. However, the web editor works extremely well. You can quickly upload a Word file or work with documents using the familiar File, Save and Open menu commands. However, on all other fronts, the news is very good, even for Mac users. On social media, you are protected from making silly little typos and spelling errors. In the posting text box, you will see that it is at work by the abbreviated toolbar that you use in the web editor. For me, one of the most common uses of an online checker is when I am writing a blog post in WordPress. With the Chrome extension, it works like a charm and there is no lag or hesitation. Very good, I have to say. Every tool you could possibly need is included in ProWritingAid. The interface is clean and is easy to understand and learn how to use. If you are familiar with similar tools, it will only take you a few minutes to be underway and using the available tools and reports. 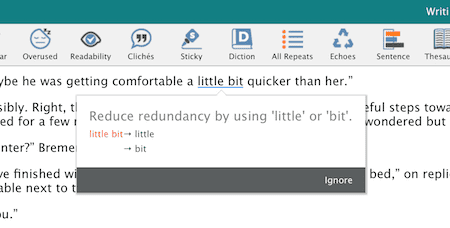 If you have never used an online grammar checker before, it will still only take you a very short time to feel comfortable using the web editor and Chrome extension. Compared to others, the depth of analysis is the standout positive. There are just so many layers of corrections, improvements and reports to help you make your writing so much better and more readable. If you are looking for an online writing coach, then you should really consider this application. I use the word, coach because compared to other correction tools, it really does act like one. There is so much advice you are offered, it really does feel like you have someone in your corner helping you along the way with your writing. So, what are the good and the not so good points? It has every conceivable writing check you could ever need or want, especially within the desktop editor. Every part of the application is intuitive and make sense. Even if you have never used an online writing assistant before, you will be up and running and productive on only a few minutes. Compared to similar paid versions for premium grammar checkers that cost over $100 per year, at $60.00 a year, and less for longer-term subscriptions, ProWritingaid really is inexpensive and affordable for most writers. This will be a winning point for many writers. ProWritingAid can integrate with Scrivener. It is a great combination for authors. There is also Google Docs integration, which is a practical advantage for many writers. ProWritingAid doesn’t have Safari or Firefox extensions or iOS integration, which are available on some other apps. 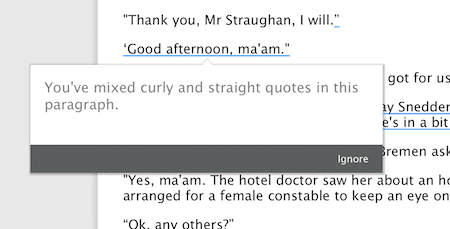 Like other grammar checkers, there is no plugin for Mac users with Microsoft Word. ProWritingAid is certainly a great app, and for the price, it’s a real bargain. For a more detailed look at what you can do with ProWritingAid, you might like to watch this short video highlighting the features of the desktop app. There are so many reviews and it has me confused. It appears that the two best writing aids are ProWritingAid and Grammarly. Currently, I use both but my Grammarly is the free version while my ProWritingAid is the paid subscription version. Is there an advantage of the Premium Grammarly over the ProWriting Aid. If you had to decide between the two, which one would you recommend? Thank you. I am using it or at least I am trying to. It has great features and editing my book is easier with it. 1. It is freezing, lagging and editing becomes extremely slow after a while. 2. The text size and type changes if you copy paste for example about 20 pages from the word. It will completely mess up the whole style. I would use it and even pay for it, but these two issues are a major no go for me. Oh as for specs for my PC. I am using it on a gaming PC, 32 RAM, i7 processor and Nvidia GeForce 980 Graphics card. It is more than powerful enough for the program not to have such issues. But it does. I’ve heard the comma correction on PWA isn,t as good as on Grammarly is this true? Both are good. But yes, Grammarly really has a thing about commas. This is great if you’re a comma addict like me. Btw, Grammarly is telling me it doesn’t like my comma after “but yes”. Well, I like it, so it stays. I used prowritingaid for a year and half, loved it. Paid for a second year of premium subscription and dang, the program quit working. It absolutely will not load on my windows 10 laptop. I can use it in google docs but my book is in Scrivener so I have to toggle between the three to get the edits done. Sigh, their technical assistance is less than stellar. Latex is for technical writing, so I doubt it will be supported by most apps. I agree, Richard. Both are fine apps, but for different writing projects. Prowritingaid is definitely the best for long-form writing. But Grammarly is great for articles and blog posts in WordPress. I am thinking a book to women arm wondering if I should write short stories with an intro chapter and a ending conclusion after all my girl or woman stories that I have experienced. Or should I write a biography in novel form chapter to chapter book.